The Capital Grille’s New $18 Lunch! 3-courses in 45 minutes - that’s the beauty of The Capital Grille’s new $18 lunch! It is a mid-day marvel unlike King of Prussia has ever seen. 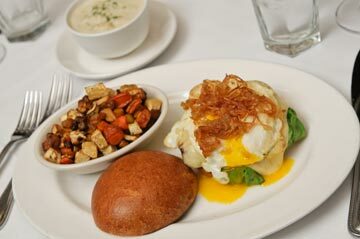 Introducing The Capital’s Grille’s incredible three-course lunch for only $18! Their new small plates, launching Monday January 9th, 2012, offer you a choice of a delicious soup, sandwich and side all artfully prepared and served at the speed of lunch. TCG expects to be very busy with their new, exciting small plate lunch so be sure to call ahead to make reservations or visit them on OpenTable. And, check out the yummy choices below! The Capital Grille is located at 236 Mall Boulevard in King of Prussia, PA. Call ahead to make reservations or visit them on OpenTable or call 610-265-1415. For additional promotions and specials, visit their website: thecapitalgrille.com. « Giveaway: Win a $100 Gift Certificate to Ardmore’s A la Maison Bistro! Sounds like a great deal. Wish they had a vegetarian dish option.